or 6 interest free payments from $0.96 with LAYBUY - Whats this? 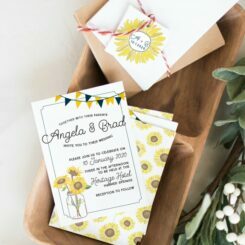 These tropical boarding pass wedding invitations are perfect for a destination wedding in the sun! Featuring a perforated, tear-off piece to the right, so your wedding invitation mimics a real airplane ticket. Your tropical escape is illustrated by a set of palm trees, seen here in a tropical blue hue (this colour can be changed to suit your colour scheme). A personalised “stamp”, fashioned to mimic a border control imprint, adds further character. The traditional font choices mark the formality of your destination wedding, whilst the boarding pass styling of the wedding invite sets the scene for where the big day will take place. The wedding invitation pictured is bilingual, as the couple are from different countries. Having a destination wedding? This vibrant “tropical blue” boarding pass wedding invitation sets the scene for a beachy get-away. The main wedding invitation piece measures 99 x 210mm. The style of this invitation lends itself to destination weddings, overseas weddings and tropical Save the Dates. Many destination weddings need extra information – this ticket has plenty of room on the reverse for additional information. A map, accommodation information or even details for a helpful travel agent could be included. The boarding pass style is a popular option for destination weddings – it sets the tone immediately for your guests. On the right hand side, the ticket stub can tear off, allowing a small RSVP card to be returned and lending more authenticity to the “boarding pass” look!